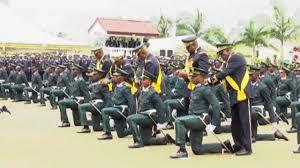 Cameroon’s Defence forces will be beefed up with highly trained officers who leave EMIA after 36 months of training. The “Unity and Diversity” batch receive epaulets Friday, 18th January 2018 at a time when the country is facing security challenges. Director of the Combined Services Military Academy, Colonel Oscar Onana Mbarga sounded very positive about the performance of the graduating soldiers. “The Example of Honour and Force”. The new officers to join the ranks of the military are expected to bring in a fresh approach in combatting remnants of the boko harram terrorist group that still make sporadic incursions in parts of the Far North Region. Also, their expertise will be needed in the East region where ex-rebels from the Central African Republic occasionally abduct Cameroonians for ransom. They will also be expected to make inputs in the current fight against grand banditry and successionist activities in the two English-speaking regions in Cameroon. The cadet officers have vowed to serve the nation with honour and devotion. The country now counts on the rigourous training in EMIA to enhance the defence of Cameroon’s territorial sovereignty.